It takes three or four to tango…to perform with competence. Depending on the model. I’ve got 2 models…one that shows it as 3-parts, another that shows it as 4-parts. The Talent Management focus is of course on the Human Assets…the care and feeding of those assets. From “cradle to grave” – as it’s been written before. Although “cradle to grave” has new meaning in today’s world…as in: your time with us. Before moving on to elsewhere. 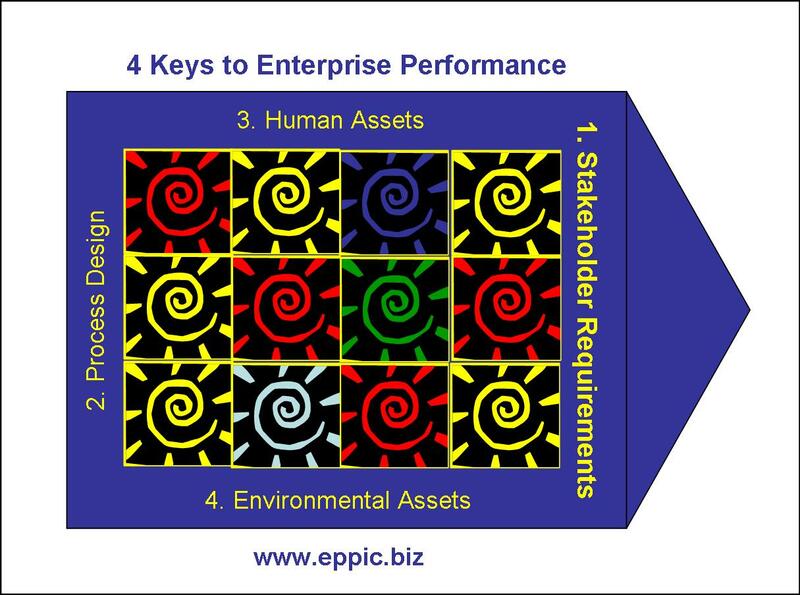 The BIG PICTURE of EPPI graphic ties all of the pieces of the performance puzzle together…the scalable groupings of processes by “the department” as the final organizational entity. Yours could be different. The view of the enablers that enable the processes to process and produce to stakeholder requirements. Performance Competence at the Enterprise level…with Society being one of the stakeholders for each and every Enterprise…public or private. Note that the paper PROCESS must be designed in the first place to meet the balanced requirements of its unique stakeholders. If stakeholder requirements are in conflict, they must be resolved. If they can be anticipated this way, then the response can be “planned for” in advance. Another department with other “owned processes” has a different set of stakeholders, somewhat unique…with some overlap. The Enterprise owners and external customers and competitors…. 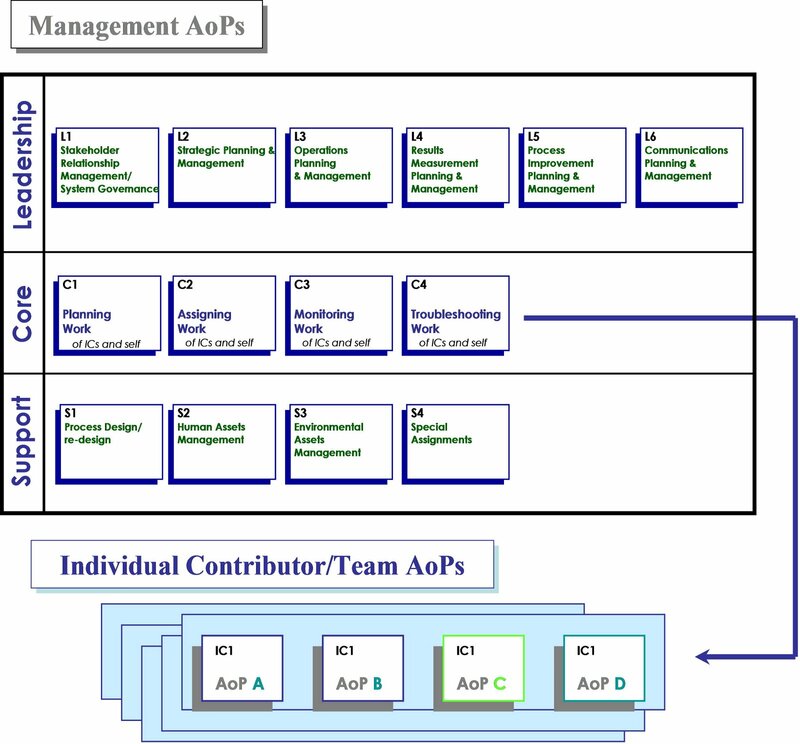 Note the AoPs in the “Blue Workstreams” can be owned by the department and/or owned by other departments…where the Individual Contributors from this department are loaned out -so to speak- to other departments to assist in that other department’s owned process or processes. Think of a shared services maintenance department staff being loaned out routinely to other departments for detailed work direction/assignments. 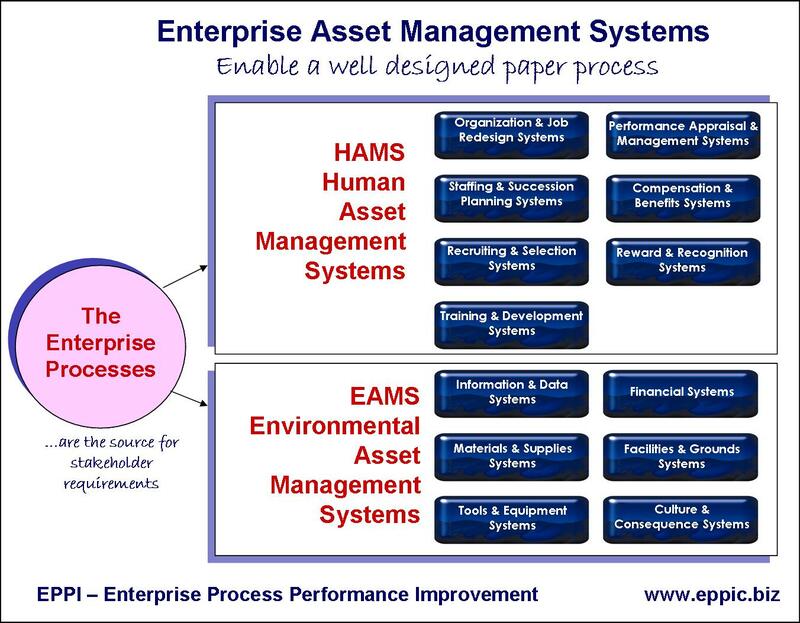 In the complex Value Chain or Chains of an Enterprise, the enabling assets enable all of the paper processes, to make it real. Without those human and environmental assets…what is there? At best it is a paper process design…or an idea for how to do something that needs to be process mapped or performance modeled. 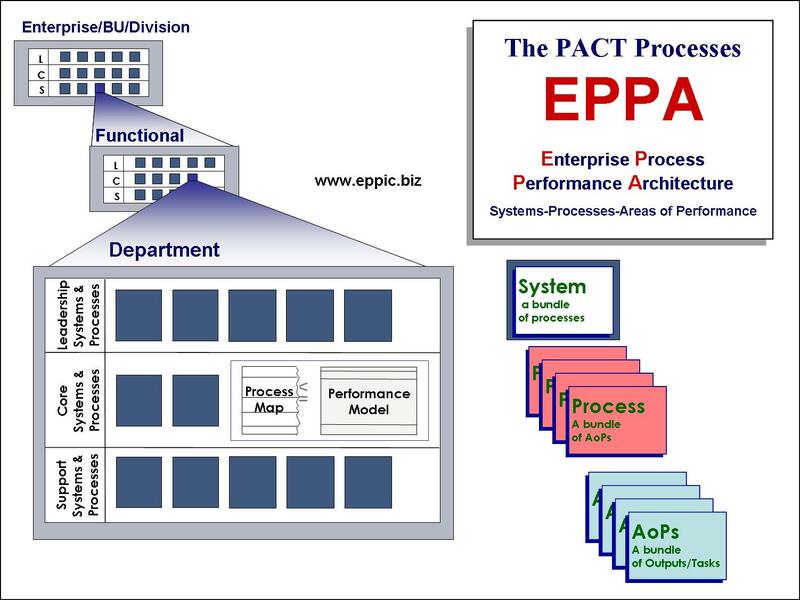 In EPPI and then in the subset methods of The PACT Processes…Processes are bundled within their owner departments in “Systems” and are broken down further, in WBS style, into Areas of Performance – AoPs. Stakeholders rule. Enterprises exist to serve them. Suppliers meet customer needs AND meet the requirements of all of the other stakeholders or risk the consequences. If the Government stakeholder says no to what the customer insists you do for them…you risk the consequences in meeting those customer requirements. Requirements that are in conflict. What would the Owner stakeholders want you to do? Is the Customer the King? One thing somewhat shortsighted in some Six Sigma approaches is the scrutiny of only the customer requirements rather than looking at all of the stakeholders, in establishing CTQ – Critical to Quality metrics. It is a fairly simple extension, to look beyond the downstream set of Customers…internal customers leading to external customers and their customers…in a complex Value Chain…or interconnected workstreams. This is an extension of the PACT Performance Analysis…which looks at Performance Competence and then at the enabling Knowledge/Skills. 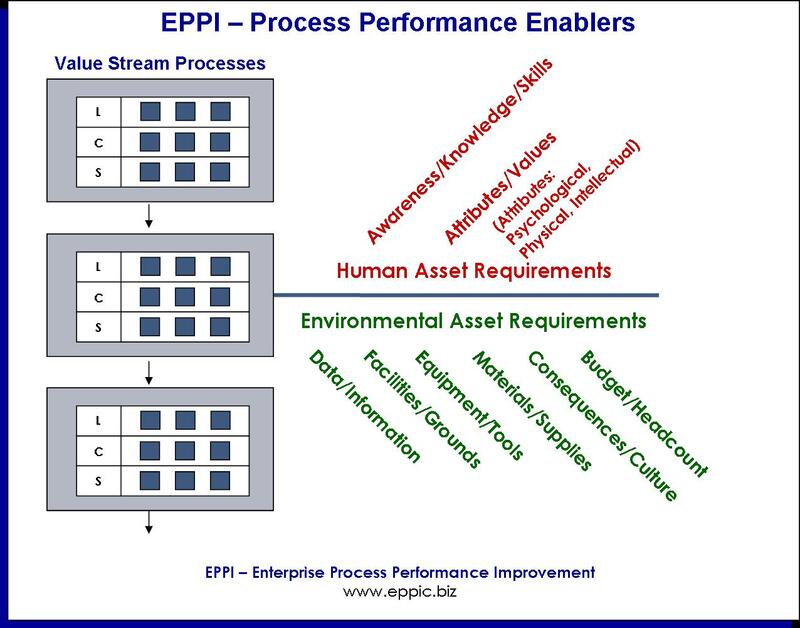 EPPI looks at the processes’ enablers more broadly than just the K/S enablers.